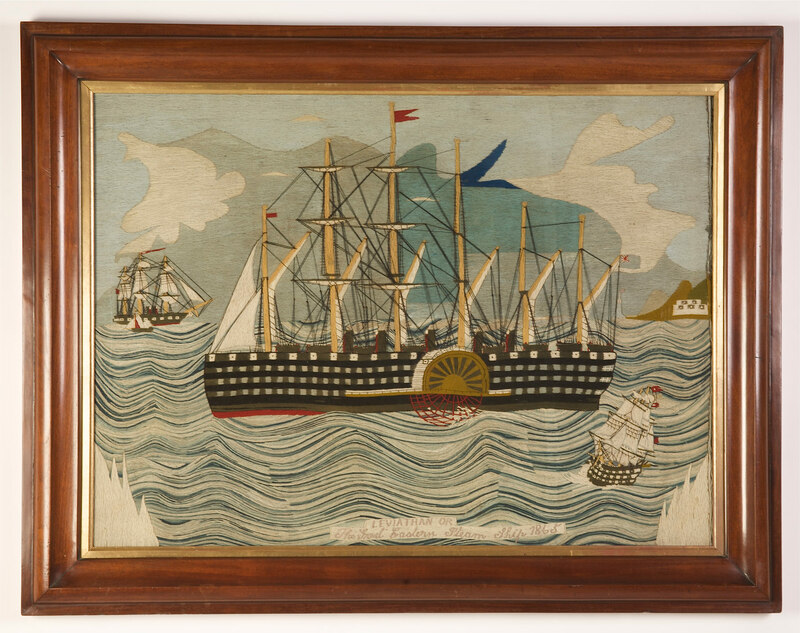 A large and impressive maritime woolwork picture titled 'Leviathan', the name synonymous with a sea monster, or 'The Great Eastern Steam Ship in 1865'. English, mid 19th century, in the original mahogany frame. Conceived in 1851 by Isambard Kingdom Brunel, construction of the Great Eastern started in 1854 at John Scott-Russell’s ship building yard on the Isle of Dogs in London. Her maiden voyage did not take place until the 31st January 1859. The idea behind the Great Eastern was that she could steam virtually around the world without refuelling. The intention was that this would give the Great Eastern the commercial edge over the lucrative immigrant trade to India and Australia. For a full article from which the above information has been taken, see The Porthcurno Telegraph Museum.